In this week's challenge you'll create a simple address book and organize the contact information you've collected for friends, family, businesses and emergencies so it is available when you need it. Part of living an organized life includes not having to search for basic information over and over again. We want and need to be able to contact friends and family quickly, when we want to talk or write to them, without having to search high and low for their latest contact information. In addition, places you don't call frequently, but you need periodically, such as the appliance or car repair shop, or your favorite hairdresser, should be readily found instead of trying to search your brain for the name of their shop to look it up in the phone book. Are you new here? 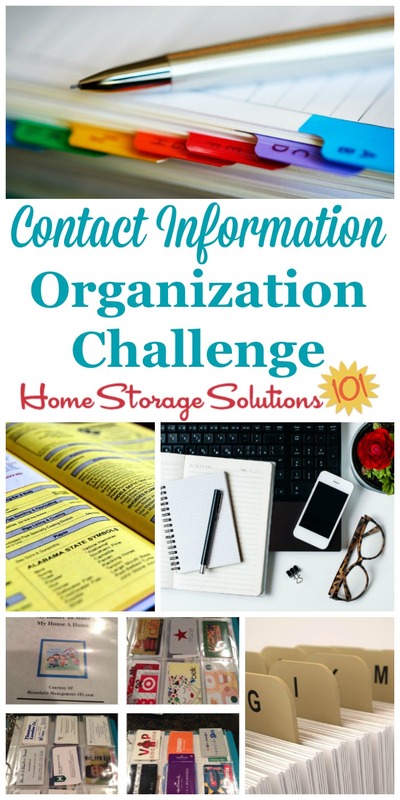 The Create a Simple Address Book and Organize Contact Information Challenge is part of the 52 Weeks To An Organized Home Challenge. (Click the link to learn how to join us for free for future and past challenges if you aren't already a regular reader). Finally, in real emergencies you want to have phone numbers or other vital information at your fingertips, so you can act quickly. This week's challenge is all about setting up systems for collecting this information, and gathering some of it in easy to reach places that we can access quickly and easily on a regular basis to make our lives easier. That means that this challenge is really a list of discrete steps to take to get all these systems in place, and your contact information in the right places in and around your home. 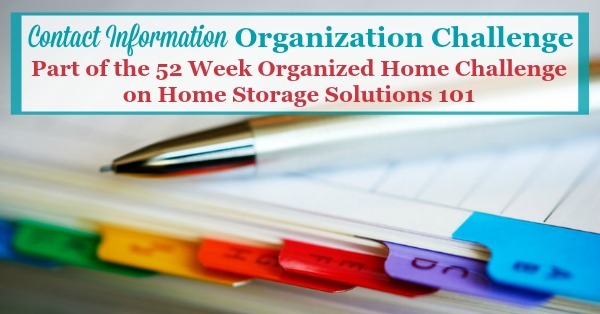 Before you begin in earnest the additional steps in this Challenge you've got to decide how you're going to organize and store all these bits of information you'll be gathering up. The three main choices include electronic, such as on a PDA or smart phone, or computer, on paper, or a hybrid method where you save some information one way, and some the other. My personal preference is the hybrid method. As long as you've got a system in place to back up your electronic information it is much easier to maintain and keep the majority of your contact information organized electronically, since we have to change and update it frequently as people move, change email addresses, etc. You can often also easily transfer electronically stored contact information from one device to another, making it much simpler than manually entering everything over and over again. Further, if you want to send out mass mailings, such as Christmas or holiday cards you can print labels easily with the electronic method. However, I do think having some contact information on paper, including a simple address book of paper, can be important. For instance, have you ever relied upon your phone to know the number for someone, and then the battery died and you had no way to access it? Has your computer crashed, or the electricity gone out, and you needed to contact someone in an emergency? Your contact information is there to make your life easier, and it can't do that if something goes wrong with your electronic storage system. That's why I like having some vital and important contact information stored in both ways. I like to call it the belt and suspenders approach. The next step in the Challenge is to create your system for collecting and organizing the contact information you receive on a constant basis as you live your life. Like I said, this main system can be either electronic or paper based, and which you choose is completely up to you. 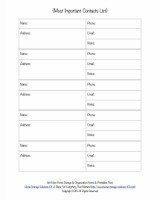 If you choose to use a paper based system entirely, or only for certain important contact information, you can use the free printable address book pages that I have created for you, to fill out your information if you wish. The important thing to do this week is set the system you choose up. That could be setting up the computer program, or making your simple address book. If you've got some numbers and other contact information ready to input, go ahead and do that too. Building on Step 2 of the Challenge, in step 3 you're going to choose some of the most important numbers and information you've collected to add to a single piece of paper which you'll put in your purse or other bag you carry around, and another in a household notebook or other place you can access quickly somewhere in your home. The purpose of this step is to be able to have important information at your fingertips no matter whether you can access your electronic contact information system or not. You should include whatever types of contact information are most important to you, but most likely including your spouse and kids' numbers, along with frequently called numbers for your work, other family, and friends. You may have other contact information types of categories to add to this too, depending on your life circumstances. 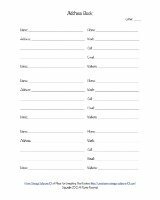 I've created a free important contact list template you can use for this step. Similarly, you should have a list of emergency contact numbers in your home for quick and easy reference if the need should arise. This includes phone numbers for poison control, emergency services, fire, police, medical and dental, veterinarian, neighbors and emergency contacts. Place this list in a central location of the house where everyone in your home, including babysitters, know where it is, and can access it quickly if needed. 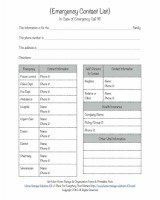 I've created a free printable emergency contact list form here that you can use for this purpose. In addition, you should also include "ICE" (which stands for "In Case of Emergency") information on your smart phone, or in your wallet. Here's my article about how to add an ICE app to your phone which allows first responders or others to access the ICE information, even if the phone is locked and you're unable to provide the passcode. Just as you should keep certain information in your purse or wallet to reference in case of an emergency, you should prepare now in case your purse or wallet is ever lost or stolen. In such situations you need to know who to contact to cancel credit or debit cards, and what the vital information on your identification cards, such as your drivers license said when you can no longer reference them. To do this I suggest making a wallet inventory. I've written an article on how to make one, and why you would want to, in more detail. Finally, the last step in this week's Challenge is to create a business contacts list so you can easily find the contact information for service providers you use, when you need them. You can use your main simple address book system that you created in step 2 of the challenge for this, if you wish. I have found, however, that I may save the name of the roofing company, under the alphabetical name of the company, but two years later when I need to know what company I used for this service before I have no idea what the name of the business is, and I search around trying to remember it and jog my memory. This is the exact type of situation in which a business contacts list comes in handy. 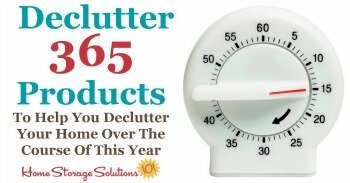 This list is a much shorter list than your main address book, only listing service providers or other businesses you use frequently, or infrequently, such as appliance repair people, utilities, auto repair companies, the plumber or HVAC service providers you only use every couple of years, etc. They are all listed on this sheet so you can easily find the contact information you're looking for when you need it. Even if you think you'll remember all this stuff I guarantee you a couple of years later you won't. Plus, it isn't just to help you, but consider that others may need this information if you're not around and it will help them also know who to contact easily. If you don't want to keep a running list of this information you can also save business cards that these service providers give to you. Use a small photo album or a business card organizer (such as the one shown on the left), and throw the business cards in it as you receive them, so they're always available for reference when you need them. 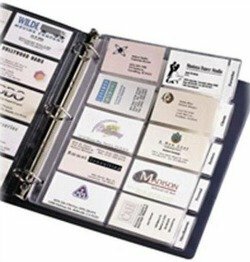 Here's my article on how to organize business cards for exactly this type of situation with more suggestions. 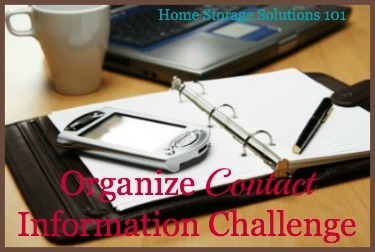 I would love to know how this week's Create a Simple Address Book and Organize Contact Information Challenge is going. You can tell me your progress or give me more ideas for how you've organized this information in the comments. I also love before and after pictures of your contact information organizing system, and would love to see some of yours. Submit your pictures (up to four per submission) and get featured in the Creative Storage Solutions Hall of Fame. You've worked hard to get organized, so now here's your chance to show off! We're working on our homes slowly, one area at a time, so don't get too distracted from the Organize Contact Information Challenge this week. However, I want you to know that this is just the beginning of organizing paper and information, which we'll be tackling for the next several weeks. In fact, next week we'll be working on a significant chunk of the paper that comes into our house each day when we tackle organization of the mail, when we create a home mail organizer center.